Manga designs or Anime designs? Which character designs do you prefer? Gin's GNG anime design and GNG manga design are very different. His anime design has his silver arms, while his manga design has white arms. Riki's two GNG forms are waaaaaaaaaaay different. His anime form looks much more bigger and. ... menacing? while his manga form is ... honestly, cuter LOL And then over to GDW, his design looks different too. I'm not sure what it is, but Kagetora's anime and manga forms look very different from each other. It could be the style's fault, but hey... it's still a difference! Maybe if it's different for each character, I'd like to know! Re: Manga designs or Anime designs? For GNG, manga all the way. The majority of choices for the anime designs I simply don't like, even though I was familiar with the anime adaption first. GDW is a tricky one, from memory the anime designs were very faithful, I can't think of one from the top of my head that was significantly different. However, Kyoushiro's anime design was slightly different, and I greatly prefer it. Likewise I quite like the way the anime simplified and designed Jerome's markings, and Hougen's lime green eyes instead of the manga's yellow? Nice! I might actually vote anime in this case. Manga. I just simply like a majority of the designs from the manga over the anime. Though I do really like Hakuro's anime design more than his manga one. Anime. I also greatly prefer Kyoushiro's anime design over his manga design. GDW: Manga (Hougen arc), the anime wonkiness is too much. It's hard for em to give anone answer because I have my preferences for each character. 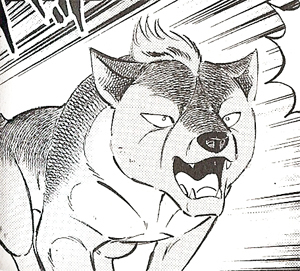 For GNG I generally prefer Akitas' (Fuji, Riki, Gin) markings from manga but I like their anime colors better. I much prefer Benizakura's manga design. For Kai bros I like that anime has them more realistic with plan fur, but I wouldn't mind if their underbellies were brighter (but not white as in manga). I also like their amber eyes in manga. Mutsu guys are manga all the way with whites and brown istead of grens and blues :I But I like them having blue eyes as oposed to brown in manga. For GDW the designs are more close to the manga but there are still some differences. I generaly prefer anime with some exceptions. I prefer Kyoshiro in anime. I also prefer Shirozaku in anime. 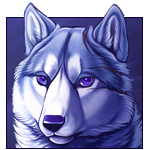 It's nice to see a grey husky instead of huskies being either only black or red in manga. For Chutora's sons I prefer manga designs. For Teru I prefer anime. 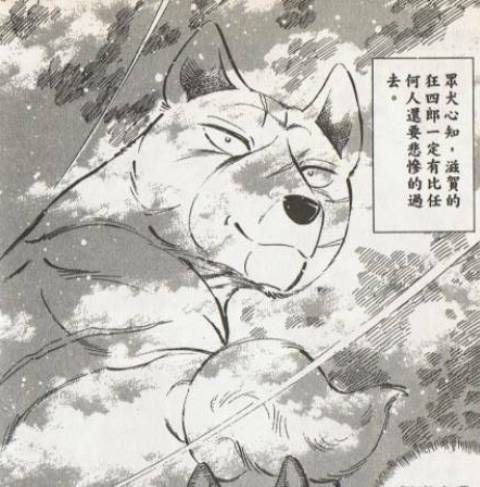 I prefer the GDW manga designs, but for GNG I slightly prefer the anime to the manga designs. This was so hard, but I think I prefer manga for both. 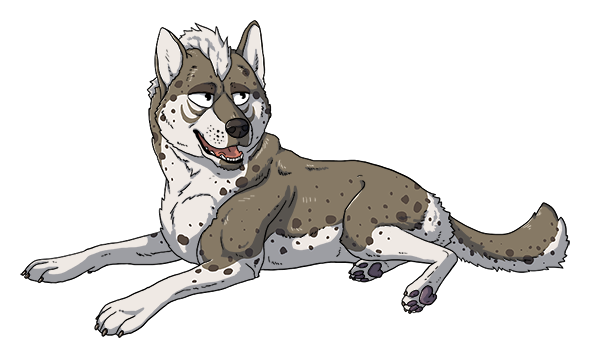 I just like how they look in the GNG manga (Gin's gray legs really bother me) and I like more manga-only characters in GDW anyway, so... yeah. Not that the anime designs are bad, they just didn't click, lol. I kind of like the GNG anime designs more than the manga designs. With GDW, I'm not sure. I think the designs are pretty much the same in both? With GDW, I'm not sure. I think the designs are pretty much the same in both? Mostly, but some characters look different. Kyoshiro has grey muzzle mark and no stlylized eyes in anime, Izou is all black&white and has yellow eyes in anime, Teru is brown and cream intead of reddish-brown and white in anime. Robert is white in manga and golden in anime. 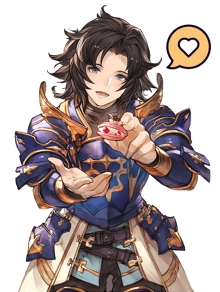 Shigure's fur has warmer tone and he has large brown eyes in manga. Surprised people like Kyoshiro's design more in the anime than in the manga! I always loved his manga design a lot more. Just a big fan of those eyes and his cute eyelashes I guess. I generally prefer manga designs over anime designs, the only exception I can think of off the top of my head is the Kai brothers in the GNG anime. 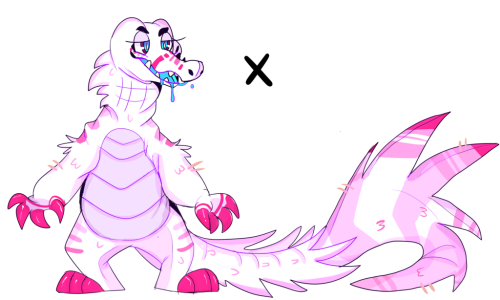 I think I prefer them with solid colors vs having an almost white underbelly (though I guess their bellies don't look super pale in the uncolored panels). 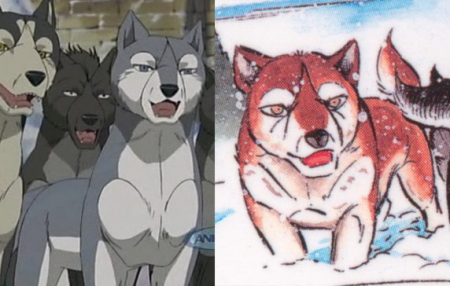 Kinda sad that the GDW anime decided to go closer the manga designs for the Kai dogs in this case hehe (especially Kuro and Kage, which I feel would be better if their coats actually looked fully black). I personally think it's charming but maybe that's just me. Sorry, I meant the one I posted in the earlier post haha. I guess I was a bit unclear. Manga. I think that Yoshihiro Takahashi's art style is definitely at its peak here. Gin has this spellbinding quality to his design. I prefer Benizakura's design with a bit more colour compared to his anime colouration too. 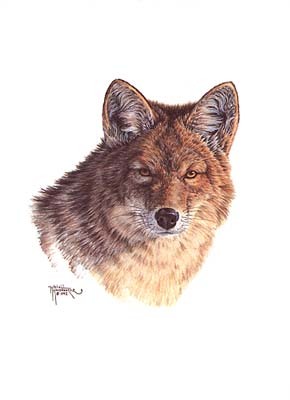 Where do I begin with how mythical the wolves look? Every page of this manga is simply a work of art! Anime. I was disappointed especially with Kagetora's design in the manga - he seemed plain compared to how handsome he looks in the anime. Anime Kyoushiro retains that classic design that he does throughout the Hougen arc in the manga - I just can't stand Kyoushiro's bug-eyed look... sorry, I can't. Oh, and at first I wasn't too keen on the Koga dogs' recolourings from brown to grey, but it has grown on me with Tesshin... 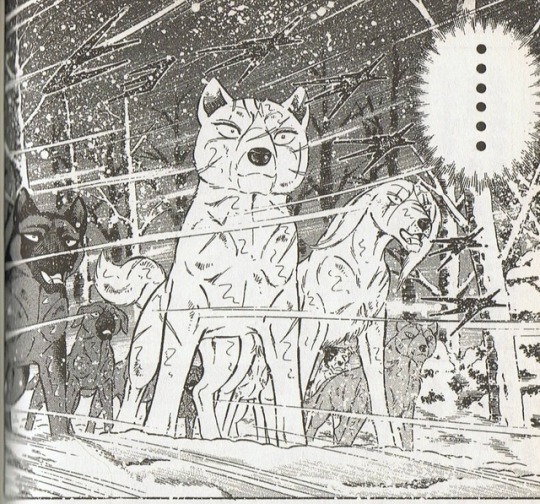 I still find that the rest of the Koga dogs look boring in comparison (especially with the common usage of cold coloured, snowy backgrounds later into the anime - brown might've stood out a little nicer, but on the other hand; I get that they're ninjas and supposed to be elusive).